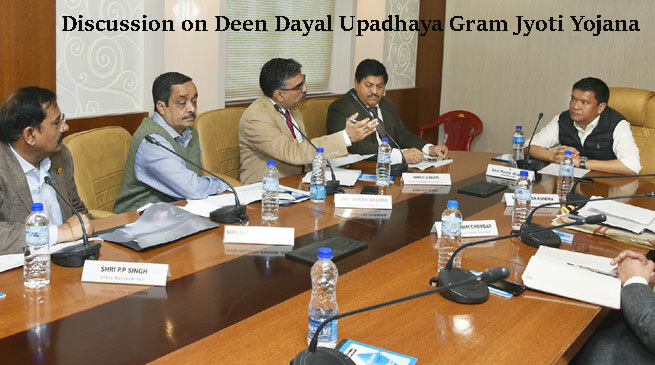 Chief Minister Pema Khandu today held a review meeting with Rural Electrification Corporation (REC) and Solar Energy Corporation of India (SECI) to discuss on the ongoing Deen Dayal Upadhaya Gram Jyoti Yojana (DDUJY) scheme being implemented in the state. The Chief Minister sought information on the status of tender floated and pending works regarding the rural electrification work under the DDUJY scheme. The officials informed that 478 villages have been identified as on-grid villages for which Rs 199 crore has been sanctioned by the centre for electrification these un-electrified villages. For the off-grid villages, the centre has sanctioned Rs 151 crores for electrification. Also the villages where there is electricity, the agencies has been asked to provide 100% household electricity coverage. For efficient implementation of electrification works, REC official requested for a full-fledged office to be set up in Arunachal to monitor the ongoing works. At present, almost 20 engineers are posted in each district to carry out the 100% electrification works in rural areas. Every week these officials make on spot surveys and report the status through a new app, GARV-II app to provide real-time data, informed the officials. The Chief Minister requested the agencies to make judicious utilisation of the funds and urged them to carry out proper monitoring to check the quality of work. Also he requested them to tie up with local firms to carry out the work efficiently and to provide economic opportunities to local contractors.